The Pindo Palm (Butia capitata) is a native of Brazil and Uruguay but now can be found all through out northern Florida, Georgia, parts of North and South Carolina, Texas and Southern California. This palm is also commonly called the Jelly Palm because of the product made from the fruit “Jelly”. The Pindo Palm Tree is a very cold hardy palm, sometimes tolerating temperature going down into single digits. The Pindo Palm has beautifully unique strongly-recurved arching leaves. 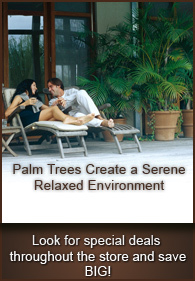 The maximum average height of the Pindo Palm is 15-20 ft and has spread of 10 ft. The unique curving of the stunning blue-green fronds gives the Pindo Palm the unique one of a kind look every garden or landscape should have. 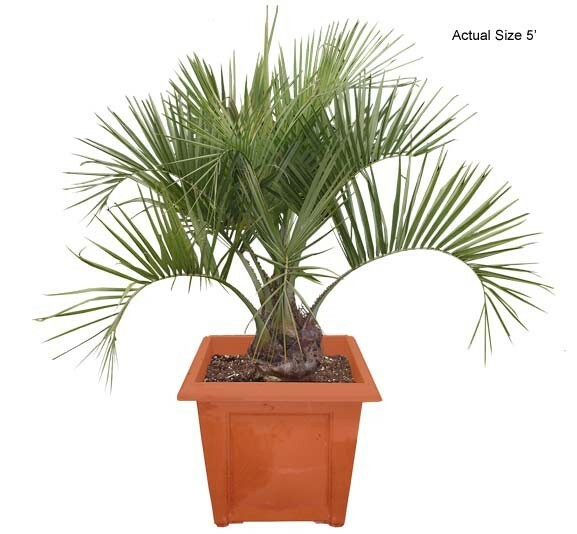 This cold-hardy palm tree is slow growing and can tolerant salt water spray. It can be found growing along coastal areas from Virginia to South Florida. Temperatures below 8-10 degrees will cause damage to the fronds unless protected. Its frosted blue-gray color is unlike any other feather like palm tree and is tolerant of the weather in high rainfall regions. The Pindo Palm will not only look great but will do great in any location you decide to place it, giving you the tropical look your looking for.